Wow. This is another wonderful piece you've done. Loved your interview. HPPF. Hi Minnie. 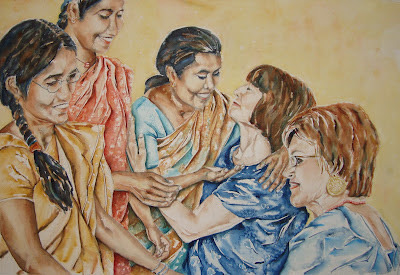 I really love your watercolor of Shared Joy. It's just beautiful and full of life. I also enjoyed reading your profile and a very interesting one at that. Nice to meet you and congrats on the interview at PPF. Thanks for sharing. Wonderful painting and quote, they touch my heart. Congratulations on being the PPF featured artist this week! Such a departure from the wild animals, but so much energy and love :). i feel such wonderful feeling in this piece. so beautifully portrayed. wow, you're just as good at painting people as animals! this is lovely. great featured artist post on PPF. your work is just beautiful! This is beautiful! It tells me a story of thankfulness,joy and bonding with friends. Happy PPF! This is wonderful, you're so talented and I enjoyed your PPF interview, thanks for sharing! Nice sentiments and nice picture ... the facial expressions do the talking! So very beautiful..full of emotion and love....and wonderful interview at PPF! AWESOME....AMAZING...interview and painting!!!!congrats! I am soooooooo excited for you! Beautiful! So much love in this painting...it exudes right off the page!! Wonderful interview, thanks for sharing!! I've just nipped over to read your PPF interview and am now the latest follower! Facinating finding out a little more about you...and I apologise for calling you Min in the past! This piece just gives off good feelings- just seeing it makes my heart smile. Thanks for such a wonderful start to my day! I love the interaction, here. And the story about your name. Gorgeous, I love this composition and the way you always use white to give it more movement- lovely work! P.S. Congrats on the feature! Congratulations on your feature this week. It was nice reading about your work. The painting sums up Sharing. Lovely painting, so vibrant and joyful! The beautiful, soft painting compliments the words you have chosen. It is so true that sharing expands the joys we feel. So true. And such a beautiful painting to express that truth. Excellent rendering Minnieme. I knew your name was a combination of names that had special meaning to you. Thanks for sharing what that special meaning is. That is just wonderful! I love all the smiles and love you captured. Great job!! btw, awesome interview on PPF! Loved learning more about you! What Kristin said. Great interview. Your work is ah-may-zing. This latest painting is great--love how you capture people's spirit. Hello Minnemie:) I love your painting. It gives a feeling of joy and happyness. Love that! Great art! Congratulations on being the Paint Party Friday Featured Artist this week! I really admire your paintings! You can feel the joy in your painting. Loved the explanation of your name as I too wondered how it was pronounced. Wonderful scene of joy and happiness in being together ! Very pretty! The colors are all so nice together and I love the subject matter and the quote! I popped over here from renate's blog - and so glad I did - absolutely love your artwork, and a great variety too.....following! I love your animals but this shows your talent isn't limited to animals. There is wonderful energy here. Enjoyed "meeting" you and understand better how you achieve such amazing elephants. Your love shine through! Simply amazing painting Minniemie! And I love your interview very much. It's so nice to get to know you! That fact that you step out and paint it's a very courageous step. You have progressed and your paintings are very expressive. Great work! I love following your work and enjoyed reading your interview so much. The women in your painting look so happy. Thank you for sharing your work. It definitely produces joy for all that are lucky enough to see it. this is such a happy painting...I love it! This is breathe breathtakingly beautiful! Thank you so much Minnimie for being our Featured Artist this week on PPF! Your work is incredible and beautiful. I can feel Africa in each piece. This one is awesome. Such a wonderful gathering of women you captured their warmth and vitality perfectly! Got to know you even more through your interview at PPF ! Absolutely love this painting...reminds of my India and all the warmth and love ! Wonderful composition. My eye circled right around through it!